The BC Environmental Assessment Office has approved an application to increase the capacity of the proposed 463 kilometre Pacific Trails Pipeline from the Summit Creek natural gas hub near Prince George to Kitimat. The $1 billion pipeline project is crucial to the success of the KM LNG liquified natural gas export terminal at Kitimat, a partnership of Apache Corp., Ecana and EOG Resources. The main thrust of the application was to increase the capacity of the pipeline to 1066.8 mm (42 inch) from the originally proposed 914 mm (36 inch). Pacific Trails will change the location of pump stations since the original proposal was for an import pipeline while now it is for export. There are also minor changes. The proposal was generally considered pro forma since the main environmental review was completed under the original application approval in 2008 and the BC government was only considering the changes proposed by PTP. The government report says officials were convinced that Pacific Trails would be able to handle problems with increased traffic and any potential risk involved in drilling under watercourses. 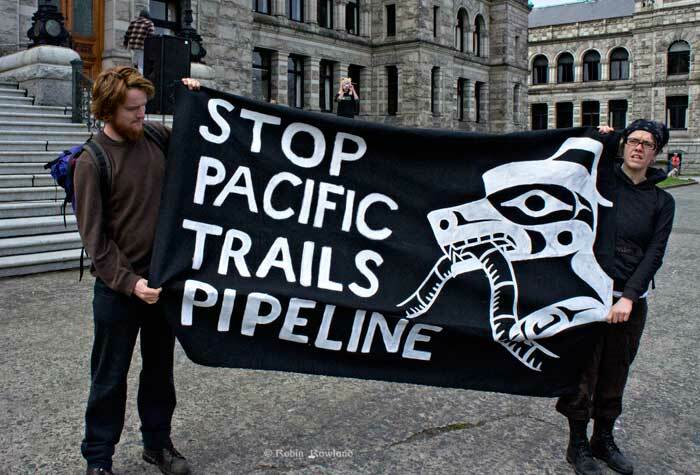 Some Wet’suwet’en houses have been vocal in their opposition to the Pacific Trails Pipeline crossing their traditional territory, The Office of the Wet’suwet’en filed a strong objection to certain parts of the plan. Fast tracking projects may result in overlooking important details [that] can have detrimental consequences. It is important to point out that the diligence required post-certification to ensure that impacts and effects on important resources are prevented or avoided is not satisfactory. This leaves the burden and legacy of any impacts to be borne by the Wet’suwet’en. We have invested considerable time and resources in the BC EAO review only to find that the level of detail required pre-certification leaves far too many unanswered questions critical for ensuring environmental effects and identification of potential infringements to our Title and associated rights from the project are avoided or minimized. The Pacific Trials Pipeline, also known as the the Summit-to Kitimat pipeline will supply the Kitimat LNG project, a venture of the KM LNG partners, Apache Corp., Encana Corp., Apache Canada and EOG Resources. The $4.5-billion LNG terminal and facility will likely be operational by 2015, depending on how long it takes for the partners to line up Asian buyers.